Nick Burris reigned as the Horseshoe Council Bluffs Circuit Main Event on Monday, winning his second World Series of Poker gold ring. 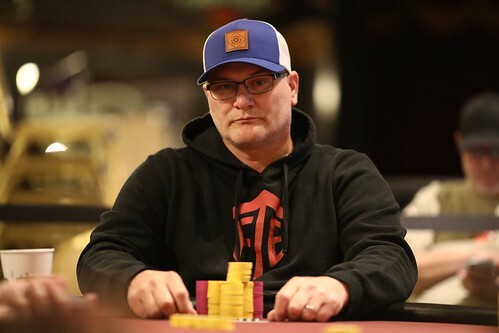 The 42-year-old from Missouri topped a field of 273 entries in Event #11: $1,7000 Main Event, which featured two separate starting flights and took four days to deem a champion. Burris snuck into the Flight A chip lead, late in the night, bagging up 346,500. “I was pretty card dead most of the day. Then, just kind of ran it up at the end; had some good bluffs that got through and some big pots that made it,” Burris recollected. The start of Day 2 did not bode as well for Burris. He lost a large chunk of his stack early. Having a cushion to begin with worked out in Burris’ favor as he was able to run it back up. Blair Hinkle is on the button and he moves all in for around 1,000,000. Burris calls and both hands are tabled. The flop comes the and Burris remains in the lead with ace high. The turn brings the to change nothing. The river is the and Burris' ace high is best. 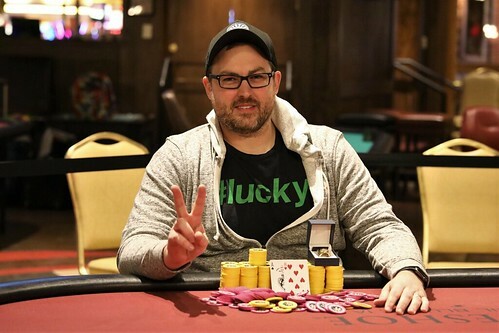 Burris earns $99,267, his second career WSOP Circuit ring and an entry to the 2019 Global Casino Championship. Hinkle will have to settle for the runner-up payday of $61,344. The two finalists are on a 15-minute break. Upon returning Nick Burris will resume action with a 7:1 chip lead over Blair Hinkle. Blair Hinkle limps in with the button in front of him. Nick Burris, in the big blind, jumps it to 305,000. Hinkle calls. The flop reveals . Burris checks. Hinkle bets 175,000. Burris comes back over the top with a shove. Hinkle mucks his cards. Blair Hinkle limps on the button and Nick Burris checks his option in the big blind. The flop comes and Burris checks. Hinkle bets 100,000 and Burris calls. The turn is the and Burris checks again. Hinkle bets 225,000 and Burris calls. The river brings the . Burris bets 500,000. Hinkle thinks for about two minutes and then drops his cards into the muck. The pot is awarded to Burris. Nick Burris raises to 200,000 from the button and Blair Hinkle calls. The flop comes and both players check. The turn is the and Hinkle leads for 350,000. Burris calls and the rivers brings the . Hinkle bets 900,000 and Burris instantly calls. Both players table their hands. Burris is pushed the pot. Nick Burris raises to 125,000 from the button and Blair Hinkle calls. The flop comes and both players check. The turn is the and Hinkle leads for 200,000. Burris calls and the river brings the . Hinkle checks and Burris bets 450,000. Hinkle thinks for about a minute and then calls. Burris turns over for a king-high flush. Hinkle sends his cards to the muck. Nick Burris opens to 125,000 on the button. Blair Hinkle three bets to 375,000. Burris calls. The flop comes . Hinkle c-bets for 250,000. Burris calls. The lands on the turn. It goes check-check and the rounds out the board. Hinkle checks. Burris eyes up a barrel of 25k chips. He detaches it from the rest, pairs it with a 5k barrel, and slides the 600,000 into the middle. Hinkle flips in a chip to call. "Straight," Burris states, showing . Hinkle slams his cards into the muck and says "nice hand." The flop comes and both players check. The turn is the and Hinkle checks. Burris bets 325,000 and Hinkle calls. The river brings the and both players check again. Hinkle tables and Burris mucks his hand. A few hands later, Hinkle raises to 130,000 from the button and Burris calls. The flop comes and Burris checks. Hinkle bets 75,000 and Burris calls. The turn is the and Burris checks again. Hinkle bets 325,000 and Burris calls. The river brings the and Burris checks for a third time. Hinkle fires 500,000 and Burris folds. The pot is pushed to Hinkle. Blair Hinkle limps in on the button. 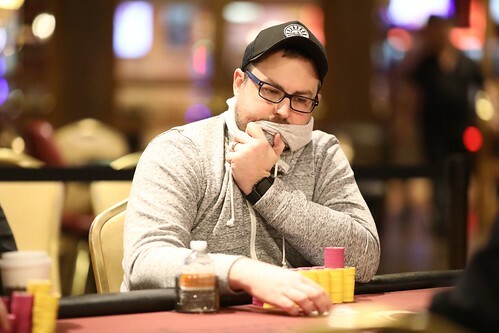 Nick Burris adds 150,000 to his big blind, making it 210,000 to go. Hinkle calls. The first three cards are . Burris bets 175,000. Hinkle calls, bringing the turn. Burris fires again, betting 300,000. Hinkle calls. Burris checks the river and Hinkle checks it back. Burris shows a bluff with . Hinkle has . "Good hand," says Burris. The next hand is underway. Burris has the button now and Hinkle is in the big blind. After a preflop raise and call they move to the flop, which comes . Hinkle bets 150,000. Burris raises to 400,000. Hinkle calls. The turn is the . Hinkle checks. Burris slides out a barrel of 25k chips for a bet of 500,000. Hinkle thinks for a bit, then calls. Again, the two check the river, which brings the . Burris shows . Hinkle tables and his pair of jacks wins it. Hinkle rakes in the pot and has now overtaken the chip lead. The flop comes and Burris checks. Hinkle bets 60,000 and Burris raises to 175,000. Hinkle calls and the turn is the . Burris leads for 300,000 and Hinkle calls. The river brings the and Burris bets 550,000. Hinkle thinks for about a minute before folding. "Pick one," says Burris, and he slides his cards toward Hinkle. Hinkle points to one of the cards and Burris turns over the . The pot is awarded to Burris and he extends his lead over Hinkle. 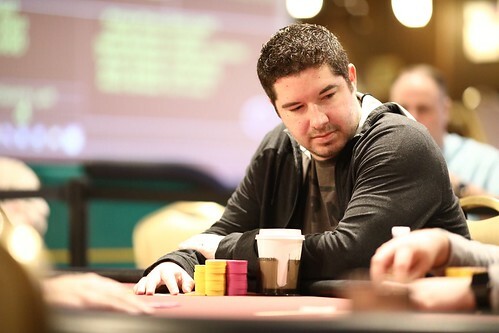 Nick Burris, on the button, raises to 125,000 preflop. Blair Hinkle calls in the big blind. The flop comes . Another small bet from Burris juices the pot a bit more after Hinkle calls. The dealer puts out the on the turn. Hinkle checks. Burris draws a second barrel from his stack, betting 250,000. Hinkle calls and the board completes with the . Hinkle checks for a third time. Burris triple-barrel bets, sliding out 400,000. Hinkle tank folds. Blair Hinkle and Nick Burris are taking their first scheduled break of the day. 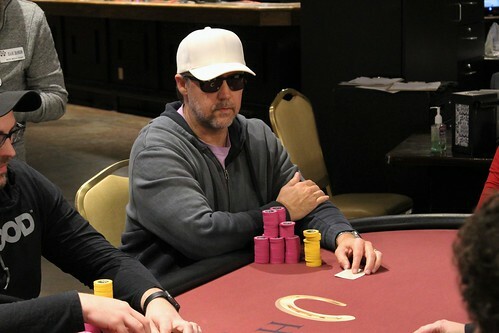 Kevin Berthelsen limps on the button and Blair Hinkle raises to 225,00 from the small blind. Nick Burris folds his big blind and then Berthelsen moves all in for around 1,100,000. Hinkle thinks for about 30 seconds. "Okay, let's go," says Hinkle. Hinkle calls and both players table their hands. "Diamonds for days," says Blair's brother, Mason Hinkle from the rail. The flop comes and both players hit their king and Hinkle picks up a flush draw. The turn is the , giving Hinkle two pair and the lead in the hand. The river is the . Hinkle has the best hand and he eliminates Berthelsen from the tournament. Nick Burris raises to 150,000 from the button and Kevin Berthelsen three-bets to 400,000 from the small blind. Blair Hinkle folds in the big blind and action is back to Burris. He takes 30 seconds and the announces all-in. The all-in is for 2,255,000. Berthelsen calls and both players table their hands. The board runs out . Burris wins the massive pot with a set of queens to become the tournament chip leader. Blair Hinkle raises to 100,000 on the button. NIck Burris calls in the small blind. Kevin Berthelsen calls in the big blind, making it a family pot. The flop comes . Burris checks, as does Berthelsen. Hinkle continues with a bet of 100,000. Burris sticks around with a call. Berthelsen folds. The turn is the . Burris checks again. Hinkle's second barrel is for 375,000, leaving himself with 650,000 behind. Burris gets out a stack of 25k chips and puts in a call. The river is the . Hinkle shoves. Burris calls out of what seems obligation in his mind. Hinkle tables trips with . Burris quickly flashes , hitting two pair on the river. Burris pays up the 650,000 and Hinkle scoops in the huge double. Greg Jennings limps in the small blind and Kevin Berthelsen checks his option in the big blind. The flop comes and both players check. The turn is the and Jennings leads for 50,000. Berthelsen raises to 125,000 and then Jennings moves all in for around 650,000. Berthelsen quickly calls and the cards are tabled. Jennings flopped top two pair, but Berthelsen hit a straight on the turn. Jennings is drawing to four outs to a full house to survive. He does not get any help on the river and he is eliminated from the tournament.